A half day trip from Prague to Karlstejn Castle, an awe-inspiring 14th century fortress to rival any in Central Europe. The tour explores the castle and the national treasures it houses. After picking you up from your Prague hotel, we take a short trip through the Czech countryside to reach Karlstejn, where we park at the foot of the castle and walk along a fairly steep path to reach the entrance. Karlstejn Castle is a huge Gothic castle built on a seemingly impregnable rocky hillside, in the heart of a thick forest. It was commissioned by Emperor Charles IV and constructed during the years 1348-55. Because it was deemed unconquerable, Karlstejn became the depository for the Emperor's coronation jewels and state documents for his whole empire. The castle still houses important Czech national treasures, the history and significance of which will be explained during our guided tour of the castle. On the tour we visit the Courtier's Hall, the Hall of Knights and chapel of St. Nicholas, the Chapter Deanery, the Royal Bedroom, the Audience and Banqueting Halls, the Hall of Ancestors, the Treasury and Jewels Hall, and the castle prison. The Czech Republic was a major European force in the middle ages and has hundreds of castles. Karlstejn is unquestionably one of, if not the finest. For refreshments, a shop in the castle courtyard sells drinks and light snacks. 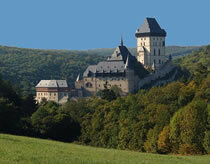 Hotel pick up + Guided tour & admission to Karlstejn Castle.